“Frankie is officially my number one travel companion. He doesn’t talk back; he sleeps anywhere, anytime; he goes along with all my ideas; and he loves the warmth. Frankie’s arrival in June this year changed our lives, but it hasn’t stopped our active lifestyle. In fact, we haven’t been home much since he was born as I’d rather get out and about with my wee man instead of sitting at home all day. Surrogate Mum, Aleisha, was able to complete the passport forms and get everything in order – it was definitely a relief when Frankie’s passport showed up the day before we were set to fly. I am lucky to have an amazing husband who sorts me out with all my Edwards and Co gears. 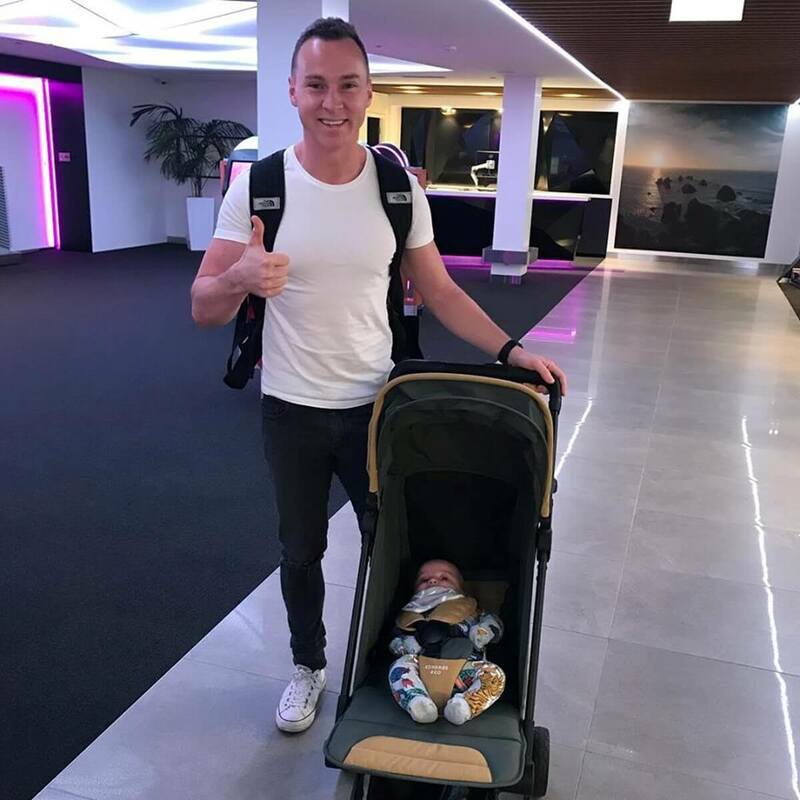 I used the Travel Bag to take Frankie’s Carry Cot and all of his clothes, nappies, formula etc. 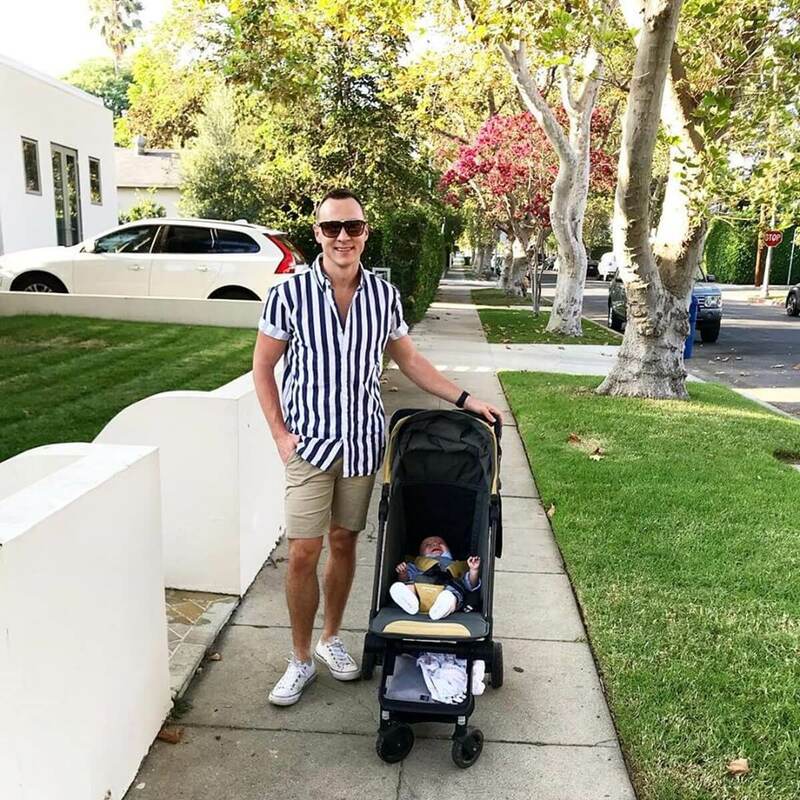 With most airlines (I flew Air NZ and United domestically in the US), you get two free checked bags when travelling with an infant – one for your stroller and the second for your car seat. Because I took Otto as a carry-on stroller, I told the airline the travel bag had my second ‘off-road’ stroller in it, which did the trick! Air NZ and United also allow you to check the stroller at the gate as you enter the plane and pick it up at the door. This is awesome if you don’t want to carry on and try and find space in the overhead locker (this can be a major mission on US airlines as everyone takes EVERYTHING on board). Flying solo! Ready to board Air NZ flight to LA...no need to disturb Frankie as Otto can be stored in the overhead locker. Dad, Christian, with then-10 week old Frankie. Both NZ and US security allow water, made up formula and milk powder above the normal limits of 100ml/100g. NZ was slightly more relaxed than the US and I was able to push the stroller through the security screener and got ‘security wanded’. In the US, they folded the stroller up themselves (must be easy!) and put it through the conveyer belt X-ray. They also had a machine that tested the water and milk before letting me go through. Both NZ and US (LAX and SFO) were really easy and having a baby sure helped as we got ushered to the front and also got to use ‘stroller’ friendly lanes. I definitely recommend taking a stroller, not only for easy navigation and being able to use your hands to shop, but also to get through security quickly. Also, a lot of people asked how I warm Frankie’s milk. I don’t. From birth Frankie has had room temperature milk, which makes everything so much easier. I was lucky enough to have the row to myself so the spare seats beside me became the perfect place to hold all of Frankie stuff. How can such a little person have so much bloody stuff?! I took off his ‘street clothes’ and had his onesie and LFOH merino underneath for sleeping. I then wrapped him up and put his little infant seat belt on, ready to fly. I made sure I had his bottle at the ready for take-off and landing. Number One Tip: Feed baby (either from the bottle or breastfeed) on take-off and landing to help ease air pressure in little one’s ears. And just like that, father and son were in LA. Ready for a week of sightseeing, sunshine and good times.